The Jaguar F-PACE line-up has been spruced up with two new visually-striking Special Edition models. To expand its World Car Of The Year winner's line-up, Jaguar has announced two bespoke special edition models of the F-PACE: a performance-spec F-PACE 300 Sport (main image) and a feature-laden F-PACE Chequered Flag Edition. 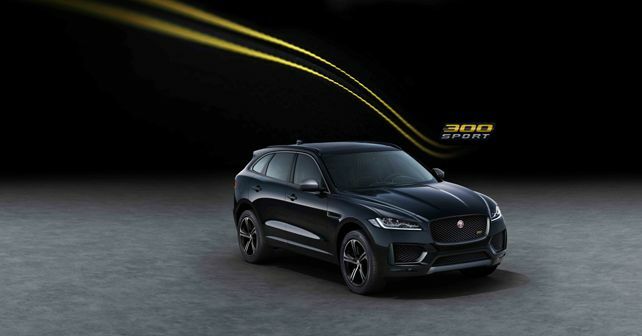 While the 300 Sport might come across as a new addition, it was only a matter of time until Jaguar brought the F-PACE under the 'Chequered Flag' rubric as a few of its models like the F-TYPE and the XF sedan have already undergone the same treatment. Further, Jaguar has also announced that the entire F-PACE range will now come with Apple CarPlay and Android Auto connectivity as standard. The 300 SPORT will be available with a choice of two 296bhp AWD motors: either a 2.0-litre Ingenium petrol motor or a 3.0-litre V6 diesel. While the former produces 400Nm of torque, the latter generates a whopping 700Nm of torque. Exterior changes on the 300 Sport include massive 22-inch grey-coloured alloy wheels with dark Satin Grey exterior detailing, which can be found on the front grille surround, side vents, side window surrounds, mirror caps and the door finishers. The 300 Sport will be offered with three exterior colour choices: Yulong White, Indus Silver and Santorini Black. The interior of the 300 Sport is differentiated by yellow contrast stitching on the instrument panel, centre console and the leather seats, with the '300 Sport' badge placed on the treadplates, carpet mats and the steering wheel. On the front headrests, the badge has been embossed. Comfort and convenience features on offer include Jaguar's Touch Pro Navigation with Connect Pro and a 12.3-inch Interactive Driver Display. A Meridian sound system, panoramic roof and 14-way heated electric front seats with memory are also part of the standard specification. However, customers can also order the 300 Sport with a host of other optional features like 18-way powered seats, Adaptive Cruise Control (ACC), Adaptive Dynamics and an opening panoramic roof. The Chequered Flag Special Edition is based on the F-PACE R-Sport model. However, thanks to the Chequered Flag kit, it gets a bespoke sports front bumper along with gloss black detailing on the front grille, door cladding, side vents and roof rails. Further exterior highlights include smaller, 20-inch Gloss Black alloy wheels as standard fitment. However, these can be upsized to 22-inch as well. Like the 300 Sport, the Chequered Flag Edition will also be available with just three colour choices: Yulong White, Santorini Back and a new Eiger Grey. Inside, the Chequered Flag Edition offers the same feature list as the 300 Sport, but with a bit more meshed-aluminium detailing and 'Chequered Flag' treadplates. It will be available with either a 247bhp 2.0-litre AWD Ingenium petrol engine option or with two diesel powertrain options, with 237bhp or with the lower-spec 178bhp motor.